Master of Lancer of Black during the Great Holy Grail War, and leader of the faction of Yggdmillennia. As the elder of Yggdmillennia who has lived for over a century. Eighty years ago, he had been decorated with a brilliant debut as an up-and-coming young magus, and had suddenly obtained a marriage proposal to a clan of long lineage that stood amongst the aristocratic Lords of the Clock Tower. The Yggdmillennia blood was polluted and impure, and couldn’t maintain itself past the fifth generation. The clan he was about to marry into didn't like risks, and so to them, he immediately became an outsider that had to be excluded. Having joined the Mage's Association like the rest of the clan, he gradually climbed up the political ladder within the Association as a wish that would never be granted. He attained the highest rank of Grand and became known as the Eight-Forked Tongue, he was a second-class instructor in elemental conversion in the Association of whose students displayed unfavorable opinions. His true strength did not lie in education, but rather his political skills. Known as a first rate swindler, he worked hard to keep his clan from falling into trouble. Although deceit is common within the Association, he was known for utilizing his extraordinary political skills to manipulate and cheat both those who trusted him and even those who did not, betraying and double-crossing all who stood in his path. Three months before the Holy Grail War, he revealed his plans, seceding from the Association to form their own group based around their family. Out of all those within the clan, he acknowledges Fiore Forvedge Yggdmillennia, believing in her potential to be the future elder. When Lancer, Archer and Caster of Black all attack the Hanging Gardens to retrieve the Grail when it has been stolen and are confronted by Lancer, Rider and Archer of Red. Lancer of Black faces off against Lancer of Red like he had previously, but is now at a disadvantage due to having his powers weakened inside the Hanging Gardens. However, Darnic then appears and forces his Servant to utilize their other Noble Phantasm, Legend of Dracula, with a Command Spell, despite Lancer being extremely hesitant. As Lancer of Black is transformed into a vampiric form, he attempts to kill Darnic who uses his remaining Command Spells to make Lancer go after the Grail and unify himself with Lancer, making them the Nameless Vampire. Darnic, as the Nameless Vampire, begins to attack the homunculi, drinking their blood and transforming them into monsters. The Servants of Black and Red decide to form an alliance against the now insane Darnic, with the recently arrived Ruler also aiding them. While they manage to fight Darnic and even partially overpower him, until the Red Faction Servants are suddenly immobilized due to their Master's being changed, allowing monster Darnic to escape further into the Hanging Gardens. 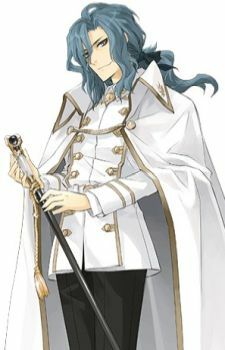 However, he is confronted by Shirou Kotomine who recognizes Darnic despite his different form and gets recognized in turn from the past by a now shaken Darnic. Before the monstrous Darnic can do anything, Shirou slowly destroys him with the Black Keys while reciting a chant; reducing the former Grail War survivor to ash.